The number 6 represents the number of years that SCRIPTed has been in existence and publishing quality scholarship. This photo of a human 6 was taken at the SCRIPTed conference, “Governance of New Technologies”, held in Edinburgh on 29-31 March 2009, and shows some of the conference delegates. 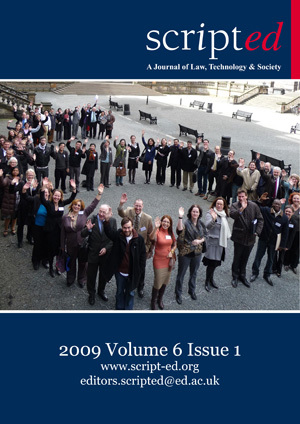 This editorial responds to the important case of S and Marper v The United Kingdom (2008) in which the European Court of Human Rights held that the law that authorises, in England and Wales, the taking and retention of DNA samples, together with the making and retention of identifying profiles for criminal justice purposes, is disproportionately broad, a conclusion which contradicts two domestic appellate panels. Game theoretic analysis of international law has traditionally revolved around the Prisoner’s Dilemma, a model developed during the Cold War that reflects the general unenforceability of international agreements. Bilateral Investment Treaties (BITs) are, however, enforceable and require a different approach. The current global economic crisis will exacerbate the controversies concerning the broad powers exercised by the arbitrators appointed under BITs. It is thus imperative to explore a viable new game theoretic model, which can be provided by virtual worlds such as Second Life and World of Warcraft. We discuss the limitations and rights which may affect the researcher’s access to and use of digital, court and administrative tribunal based information. We suggest that there is a need for a European-wide investigation of the legal framework which affects the researcher who might wish to utilise this form of information. A European-wide context is required because much of the relevant law is European rather than national, but much of the constraints are cultural. It is our thesis that research improves understanding and then improves practice as that understanding becomes part of public debate. If it is difficult to undertake research, then public debate about the court system – its effectiveness, its biases, its strengths – becomes constrained. Access to court records is currently determined on a discretionary basis or on the basis of interpretation of rules of the court where these are challenged in legal proceedings. Anecdotal evidence would suggest that there are significant variations in the extent to which court documents such as pleadings, transcripts, affidavits etc are made generally accessible under court rules or as a result of litigation in different jurisdictions or, indeed, in different courts in the same jurisdiction. Such a lack of clarity can only encourage a chilling of what might otherwise be valuable research. Courts are not, of course, democratic bodies. However, they are part of a democratic system and should, we suggest – both for the public benefit and for their proper operation – be accessible and criticisable by the independent researcher. The extent to which the independent researcher is enabled access is the subject of this article. The rights of access for researchers and the public have been examined in other common law countries but not, to date, in the UK or Europe. It was only eleven years after the European Patent Convention (EPC) 1973 came into force that the Enlarged Board of Appeal (EBA) in EISAI/Second medical indication finally settled the issue of whether patent protection should be provided for second or further medical uses of substances or compositions. This issue had divided the delegations during the drafting of the EPC, where the pharmaceutical industry lobbied tirelessly for patent protection. The EBA’s decision did not sit comfortably with the text of Article 54(5) EPC 1973 and seemed contrary to the intentions of the drafters of the EPC. An examination of: (a) the intentions of the framers of the EPC; (b) the considerations that guided the EBA; and (c) the subsequent developments at the EPO, is poignant given the importance of patent protection for second and further medical uses in fuelling research and development in finding cures of illnesses. Consequently, the objectives of this paper are to: first, examine the travaux préparatoires of the EPC to see what light they shed on the interpretation of Article 54(5) EPC 1973; second, explore the origins of second medical uses and the decision of the EBA in EISAI/Second medical indication; third, delineate the requirements of the Swiss-type claim, including the form of claim; fourth, examine the decisions applying EISAI/Second medical indication to find out whether they have extended that decision beyond its original parameters; and, fifth, evaluate the recent changes heralded by the EPC 2000. The APEC Asia-Pacific Privacy Initiative – A New Route To Effective Data Protection Or A Trojan Horse For Self-Regulation? Asia Pacific Economic Cooperation (APEC) is a grouping of twenty-one member economies in the Asia Pacific Region. It was established in 1989 to facilitate economic growth, cooperation, trade and investment in the region. The APEC Privacy Framework was adopted by Ministerial Declaration in October 2004, after a two year development by a Privacy Subgroup of the APEC Electronic Commerce Steering Group, with the Implementation section added a year later. The Subgroup has continued to meet regularly to progress implementation of the Framework. The current emphasis is on a number of linked Pathfinder projects, in one or more of which sixteen of the twenty-one APEC member economies are currently participating. This paper considers the APEC Privacy Framework, its strengths and weaknesses, and its interrelationship with other international privacy instruments. Social Contract for the Internet Community? Historical and Philosophical Theories as Basis for the Inclusion of Civil Society in Internet Governance? Netizens are affected by decisions taken with regard to Internet governance and should therefore be able to influence such. However, the heterogenity of Internet users requires special efforts in order to find a method of consensus building which includes all interested parties and creates the opportunity to make decisions acceptable for as large a part of the civil community as possible. Notwithstanding the fact that the Internet society is a newly emerging civil society, considerations taken into account in earlier contexts can lead to valuable lessons. In this respect, a theory which seems to offer a feasible approach encompasses the concept of a so-called “social contract” that is historically and philosophically addressing issues of civil society’s participation. Through the establishment of a civil society, each individual is protected by the whole of the community. The inclusion of civil society requires the implementation of a bottom-up process allowing responsiveness of the concerned actors in a rational discourse which improves democratic quality of the structures. Furthermore, each individual should be granted with the same rights and obligations in the sense of the same chance to development for everyone, in particular with respect to the use of freedom by having the social contract which secures the self-determination of all individuals. Furthermore, a new forum should be created which could realise appropriate fairness in all decision-making matters. On the 27th of February 2008, the German Federal Constitutional Court (Bundesverfassungsgericht) recognised in a landmark ruling for the first time a new constitutional right in the confidentiality and integrity of information technology systems. We will show in this case commentary why the Court found it necessary to introduce new legislation, and provide an overview of the newly established constitutional right. The authors argue that the paperless world of discovery has arrived, and it is time for all litigators to consider “signing up” for the “Discovery Training Camp”. If your law firm represents cross-border businesses or companies, you need to be aware of the substantial changes in the US affecting electronic information in legal and regulatory matters, as well as the new Canadian requirements promulgated at the provincial and federal levels. This article offers a vital insight into this area. This paper is about legal questions connected with cloud computing, the business trend in which computation is carried out on behalf of a user on remote machines, using software accessed through the Internet. The user may not know where these machines are; they are “somewhere in the cloud”. Some of these legal issues will be resolved by standard agreements between buyers and vendors. I will give some examples from current agreements from prominent cloud service providers. Other issues will probably end up in court. It makes sense to consider these questions now, before they become urgent. Nanotechnology – New Challenges for Patent Law? After the advent of IT and genetic engineering, patent law now faces another challenge: nanotechnology. Being a hybrid of chemistry and engineering, nanotechnology holds some peculiarities that cause special problems for patent law. Among these are: the patentability of naturally occurring products; the distinction between compound and apparatus claims; and the patentability of selection inventions. The challenges, however, can probably be overcome by consistently applying existing patent law principles.